Urbana University totaled negative three yards of net offense in a 6-0 loss to Fairmont State, a game that had cold, blustery conditions on homecoming Saturday in UU Stadium. But despite the lack of production offensively, UU was never out of it by limiting the Fighting Falcons in the red zone and surrendering the only points of the game on two field goals. UU (1-4, 1-4 MEC) seemed to go ahead on its second drive of the game when running back Ben Sasu broke free for a 52-yard touchdown run. However, the play was negated after off-setting personal foul penalties were called on each team. That call proved devastating for the Blue Knights as they never found their rhythm offensively. UU only reached FSU’s side of the field twice the entire game. The best field position for UU came after the Blue Knights recovered a fumble on the FSU 33. Everything seemed to go wrong on this day though, as a botched hold on a field-goal attempt wiped out the UU threat. For the game, UU failed to convert a third down on 10 opportunities and ran only 38 plays – a Mountain East Conference record low. 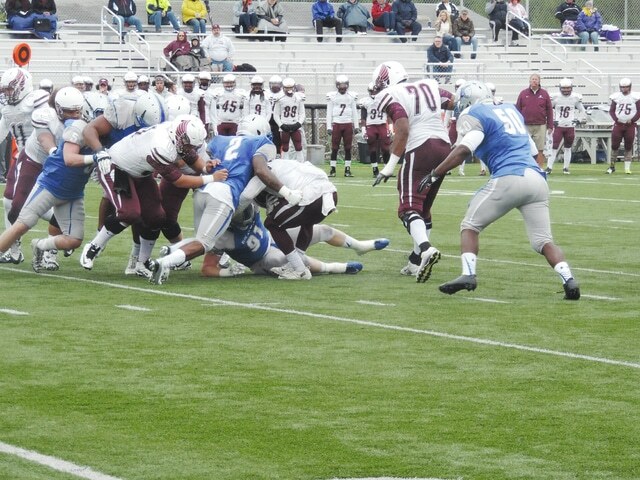 The Blue Knights finished with negative 27 yards rushing with most of those marked down on Fairmont State’s four sacks. UU junior QB Eric Pelfrey faced constant pressure in his second career start behind center. He managed to complete only six passes on 17 attempts, totaling 24 yards through the air. Defensively, UU’s big three at the linebacker positions stood out. Senior D’Gary Wallace, the MEC’s leading tackler, racked up 18 tackles with one sack. Junior Kevin Chapple also picked up a sack and had 12 tackles. Senior Bo Keener tallied 11 stops. All three registered two and half tackles for loss. Wallace took over sole possession of third place all-time in UU history with 47 career TFL’s. Several other defensive players played well, including Curtis Galloway (career-high 10 tackles), Chuck Wynn (tied career high with eight tackles) and Clayton Bullard (career-high eight tackles; fumble recovery). Fairmont State (2-2, 2-2 MEC) made its first field goal on the opening drive of the game, a 20-yarder with 9:33 on the clock in the first quarter. The scored remained 3-0 all the way until the 7:33 mark in the fourth, when FSU chipped in a 28-yarder. FSU totaled 351 yards on offense, led by Terrell Charles who ran for 124 yards on 24 carries. QB Cooper Hibbs finished 11-of-24 for 97 yards passing. UU still has not scored any points on offense in three home games this season. In those games, the Blue Knights have been outscored 78-7. The record for fewest yards allowed between NCAA Division II schools stands at minus 69, which happened on Oct. 16, 1993, in a matchup between Fort Valley State and Miles. UU will step out of conference play this week for an in-state showdown at Lake Erie. Kickoff is scheduled for 1 p.m. on Saturday.